Where to Find EV Plugs at 5 Iconic San Diego Destinations! Live in San Diego and own an electric car or thinking of purchasing one? You may be wondering where you’ll be able to charge your car during your summer adventures around the county! Whether you’re spending the day on Coronado or cruising out to Mount Laguna for some stargazing, alleviate your range anxiety with this list of Electric Vehicle (EV) chargers in San Diego’s most iconic destinations! 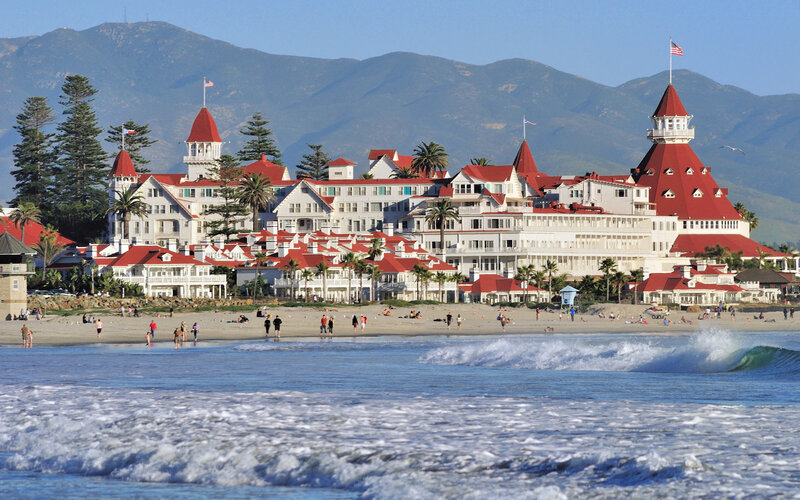 Have brunch at the Hotel Del Coronado while charging your car! The Del offers its own EV chargers (you need to either be a guest of the hotel or park in their lot), but you can also find more EV chargers at Coronado City Hall located at 1825 Strand Way. While at Balboa Park you can thoroughly enjoy the museums and beautiful grounds without the anxiety of wondering how you’ll make it home! Balboa Park offers more than fifteen EV chargers. You can find charging stations outside the San Diego Air & Space Museum, the Fleet Science Center, and at the San Diego Zoo. Bonus: If you ever find yourself with nothing to do on a Tuesday, visit Balboa Park as different museums and facilities offer free admission for San Diego residents! If you’re thinking of swimming with the leopard sharks at La Jolla Shores know that you can plug in your car at the La Jolla Shores Hotel or the La Jolla Beach & Tennis Club. There are also some additional EV charging ports at the Hotel La Jolla. You will want to check with each establishment about any fees for use. Whether you’re spending the day at the beach or shopping in the Del Mar Village, you can rest easy knowing that there are many EV charging ports in the general vicinity. Visit L’Auberge Del Mar, Del Mar City Hall, or the Del Mar Community Services Department. Don’t forget to come visit us at our Del Mar office location at 1217 Camino Del Mar! If you plan to do some stargazing this summer, plan a trip to Mount Laguna during the Perseid Meteor Shower (which peaks around Mid-August). Just be sure to charge your car before you head up the mountain! There are no EV chargers at the actual observatory however you can find some charging stations on the way at Santa Ysabel, Julian, and Pine Valley. To find even more EV stations in San Diego, download the free Plus Share app!